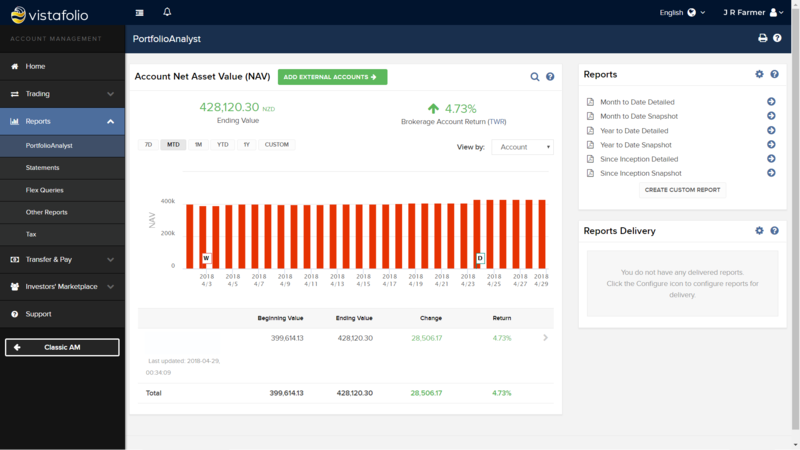 Vistafolio provides a unique facility where we analyze, select and manage global share investments in your own account. We offer an institution-grade separately managed account service accessing wholesale money market rates and broker margin lending. And we guide you through the process. This service is subject to eligibility criteria. Integrity and control: The account remains in your name and ownership - denominated in your preferred currency. There's no blind pooling in a fund, so you have far more control over your investments. Perhaps this is why large institutional investors the world over prefer separately managed accounts. Better returns: Low overhead, regulatory and operating expenses mean that investor fees are focused on in-depth research, analysis and effective management of your investments. There are no additional fund, administrative or custody charges (excepting low brokerage on individual trades). Protection: On the account side, your brokerage account is protected up to US$30 million (including up to $1 million for cash). Our broker offers more robust account protection than many banks. Timeliness: We invest your money in the opportunities that are relevant at the time you invest, match your investment plans, available funds and currencies held. This is different to a fund, where you may be investing in past opportunities. We run a limited number of accounts at any one time to optimize our service. Transparency: 24/7 online access to your investment account providing maximum visibility on what is happening with your investments. You'll also have access to a range of portfolio analysis and reporting options, plus our monthly update and explanation of the strategy. Flexibility: You can deposit funds anytime or withdraw funds from your account by simply advising us. From your account you can securely transfer funds in most major currencies to or from bank accounts worldwide. Broker margin lending	is available, secured on your holdings, with cash available from rates as low as 2.5% p.a. Investor experience: Receive advice on trades and the reasons behind them as we invest for you. Login to your portfolio at any time and watch what's happening in the markets. Be a part of our exciting and rewarding investment strategy. Minimum charge NZ$58 per month (approx. US$39). Plus brokerage of $2 to $12 on trades. *High Water Marked (meaning you only pay for gains above the previous highest level). Can I use the service to gain a regular income? Yes, dividends can be withdrawn from the account rather than reinvested - although we do recommend reinvesting them to take advantage of compounding returns. Simply let us know your requirements as our managed portfolio service is flexible and can be customized to your needs. How can I load my account with funds? Simply complete a deposit notification online and then transfer the money from your bank. Your account can accept currencies and bank transfers from around the world, with no fee to load. Can you assist me to buy/manage/analyze certain stocks? Yes, for approved accounts we can provide direct and advisory investment services across worldwide markets. We offer a global stock investing service at competitive rates. Please contact us to discuss this option. Why is this service only available to Eligible and Wholesale Investors? As you will be opening your own global brokerage account to enable this service, it is appropriate you have previous experience with financial products such as shares or managed funds. This focus enables us to offer a cost effective wholesale service. Vistafolio investment services are available to Eligible Investors and Wholesale Investors (not to Retail Investors) as defined in the Financial Markets Conduct Act (2013). Vistafolio is a trading name of Angelo Partners Limited. Registration No. FSP596789. We are registered as a Financial Service Provider for investing money, portfolio management and trading financial products or forex on behalf of other persons, and wholesale/generic financial adviser services. S. Angelo is a member by examination of the Personal Finance Society. Broker securities accounts are protected by the Securities Investor Protection Corporation (SIPC) up to $500,000 with an additional SIPC excess policy with certain underwriters at Lloyd's of London. *Past performance is not an indicator for future performance. Your actual portfolio will differ from the composite portfolio mentioned. Annualized returns are after management fees and after withholding taxes. Nothing on this website is an offer, or an invitation to apply for financial products, or a recommendation or advice in respect of financial products. Copyright Angelo Partners Limited T/A Vistafolio. The Markets newsletter is sent monthly. Privacy assured, cancel at any time.